SAKHIR, Bahrain, Sunday - Defending world champion Lewis Hamilton took advantage of Ferrari new boy Charles Leclerc’s wretched misfortune on Sunday when he claimed a dramatic victory for Mercedes in the Bahrain Grand Prix. The five-time champion, who looked to be heading for second behind the 21-year-old Monegasque, gained the lead with 10 laps remaining when Formula One’s new star, who claimed a record-breaking pole position for Ferrari on Saturday, was hit by engine problems. 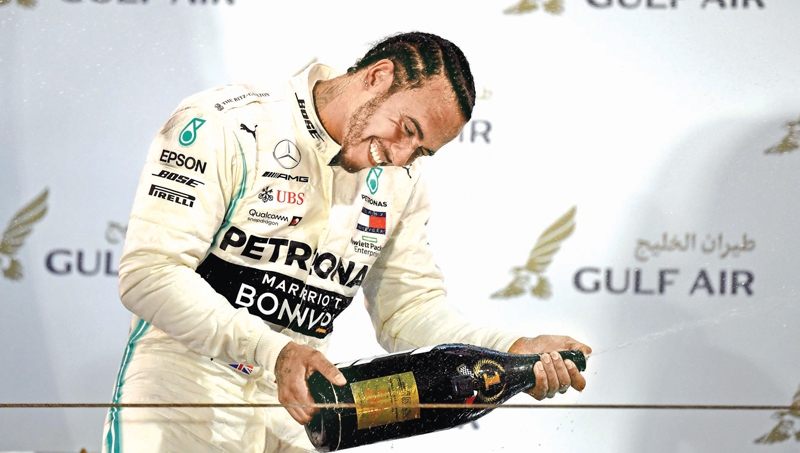 As he slowed, Hamilton hunted him down to claim his first win of the season, his third at the Bahrain International Circuit and the 74th of his career ahead of Mercedes team-mate Valtteri Bottas, who won the season-opening Australian Grand Prix. It was Leclerc’s first podium finish in F1 and he also scored a point for fastest lap. His finish made him the first Monegasque driver to take a podium since Louis Chiron in the 1950 Monaco Grand Prix. “You drove brilliantly, really great, this weekend -- you have a long future ahead,” Hamilton told Leclerc. A lap later Leclerc and Hamilton also came in, the Englishman’s move acting as an “under-cut” to Vettel, who stayed out on older tyres. It was costly for the German as Hamilton breezed by before he re-joined following after lap 14. Finally, as Romain Grosjean retired his Haas, the order settled with Leclerc in control ahead of Hamilton, struggling with his rear tyres, Vettel and Bottas.